The original Mironekuton® stone from Japan is a mineral rock, 100% natural and without additives. Due to its manifold beneficial characteristics it is highly popular with Japanese shrimp breeders and plant tank keepers, especially in combination with soil subtrates, as it significantly enhances the all-important microbiology (bacteria, accompanying fauna). Mironekuton® is used as mineral supplement and water conditioner during the cycling phase of the tank and thus can benefit the development of the important microorganisms in the filter and the ground from the beginning. When the tank runs, Mironekuton® gives off minerals constantly and thus provides the inhabitants and the useful helpers in your tank with the minerals they so desperatly require. In addition to all these positive characteristics, Mironekuton® stabilizes the pH value and thus prevents dangerous pH plunges. It sustains total hardness (GH), improves the water quality as well as the ion exchange capacity and provides for better plant growth and root formation, enhancing photosynthesis and the formation of oxygen. It absorbs noxious substances, makes the water crystal clear and removes odours. 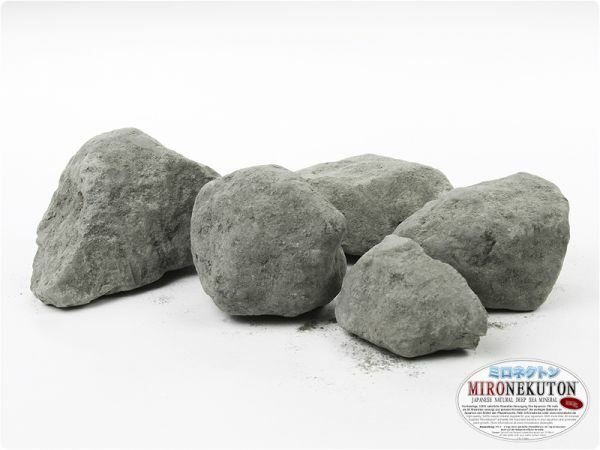 Place Mironekuton® mineral stones nside your aquarium, where they act as a natural mineral depot that is available for all the tank inhabitans at any given time. The stones can also be placed in the filter sump or directly in the external filter canister. The outer loose layer of the stones comes off in water. If you hold the stone in your hand in the water you can easily rub it off and thus spread the powder evenly in the water to increase its positive effects. Should you not want this, you could just rinse the stone under running water. Approx. 100 - 150 grammes of Mironekuton® Mineral Stone to 10 litres of tank water. The stones give off their minerals far more slowly than the powder so the dosage has to be higher.